…despite working alongside smart and organized people, we spend too much time doing “work about work”. This wasted energy – writing and reading emails, attending status meetings, and tracking down updates – slows us down, reduces our collective output and keeps us from setting larger goals. The two men concluded that tools like email, documents, files, and wiki could not keep up with the “scope of their ambitions,” and set out to build a new kind of web application to manage Facebook’s internal coordination. Soon after its implementation, Asana quickly began to replace daily meetings, reduce the volume of emails, and help people work at peak efficiency. Asana was officially released out of beta and made available to the public in 2011. This software is currently used on six continents by a diverse range of industries and businesses, and big-name clients include Dropbox, Virginia Tech, Pinterest, and Synthetic Genomics. Asana is web-based, so you don’t have to download anything in order to use it. Asana can bill annually and offers a free two months for agreeing to such a deal. You can pay with any major credit card, and for teams of over 50, you can send them an invoice. You may contact Asana sales directly for information about custom plans if you have a team with over 100 members. Hypertext: This feature allows you to provide useful links to teammates, projects, tasks, and tags from any notes or comments field in Asana. Simply place an @ symbol before typing the information you want to connect (much like you would on Twitter). Hyperlinks can increase work efficiency by relating pertinent files and pieces of information, helping to label dependencies for a clearer understanding of the workflow, and making it easier to add followers to a task. Keyboard Shortcuts: Asana provides a great list of keyboard shortcuts for common or oft-used functions (adding followers, moving or deleting tasks, setting due dates, posting comments, etc.). Color-Coded Projects: In Asana, you can color-code your projects in a way that is unique to your personal view of Asana. Colors can be used to help you make quick, visual distinctions between your projects, but are also useful for categorizing different kinds of work (for example, you could use blue for Marketing projects, green for Sales projects, orange for Meeting projects, etc. ), or highlighting the priority status of your workload (red for p1, yellow for p2, and so forth). Getting Started Quick Tour: When you first boot up Asana, you are quickly guided through making your first project and tasks with directions on the screen. This is a helpful, quick way of grasping Asana’s most basic functions. There is plenty of stuff the tour doesn’t show you, but it will get you off the ground. Direct Customer Support: Personal, specific questions and concerns that cannot be answered by the User’s Guide may be addressed directly to Asana via their customer support ticket system. Users are asked to fill in a few brief pieces of information and then give a very detailed overview of the problem. Responses generally come within 24 hours. Asana User’s Guide: This page is the source-of-all-knowledge for Asana users, containing video tutorials, written guides, an FAQ, user tips, and sundry other bits of pertinent information. I found it to be quite helpful, both in explaining the product’s core features and in providing good getting-started advice. Asana’s video tutorials are incorporated directly into this guide as well. Customer Success Program: Subscribers to the Premium Plan have access to Asana’s Success Managers: a team of individuals dedicated to ensuring customers enjoy a positive experience with their project. These experts will help you through initial deployment, workflow and productivity consulting, and ongoing training. Social Media Engagement: Asana’s Facebook page is frequently updated with a wealth of general information, news, and alerts about product development and improvements. I have seen several users pose questions on the site, but they do not seem to be publicly answered there. The Asana Twitter feed is a better place to look for up-to-the-minute alerts about minor glitches and issues that may be temporarily plaguing the system. You can also find the usual run of press releases, reminders, etc. Customers seem to tweet occasionally, but the Twitter feed is not necessarily the place to go for personal support questions. Rigid Structure: While Asana technically can be used for a wide range of project management styles, it is essentially a task management program, and does not function well outside the scope of basic task management. Overly Simple Interface: Asana is a bare-bones kind of program; what you see is what you get. Many users dislike the lack of Gantt chart capabilities and wish that the software offered a few more features (like risk tracking or resource management). I saw one review claiming that designers find the interface excellent, but the engineers find it unintuitive. Poorly Suited For Enterprise Organizations: This software is really intended more for small, compact organizations, and does not adapt well to companies with a larger scope or multiple departments. Uncomplicated Interface: It is nearly impossible to get lost in Asana. This software is accessible and practical for even the most computer-illiterate. Free Option: Not many companies offer a free service for up to 15 people. Asana is unique in this respect, and much appreciated by start-ups and small businesses which have the option to upgrade as they grow. The free version is also popular among students, who use it to manage their course loads. Excellent Keyboard Shortcuts: Many users have commented favorably about Asana’s keyboard shortcuts, which are generally perceived as an efficiency-booster and time-saver. Appropriate for Personal and Business Use: Asana allows users to easily compartmentalize between personal projects and work. The best part about this application is there is very little magic to the whole thing. There are projects, tasks, and not much else. Entering a task is incredibly simple. You can easily share with other members your group. For creating working flows and keeping on task within a team for projects Asana is a great tool! Especially when a certain project requires multiple touches from multiple people. Now, if I want to know what’s going on with a project or what the status of anything is, I just look at Asana and everything is instantly clear. Asana makes our process so much more efficient. It removes all the waste in communication. 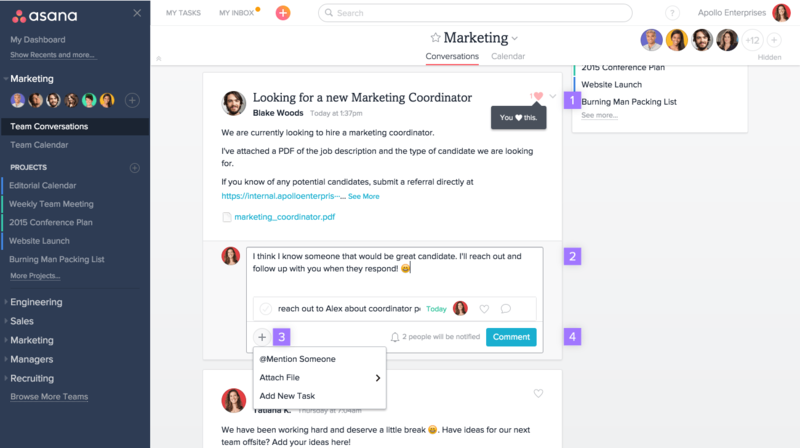 Asana is a bare bones task management and team collaboration service—and that’s a good thing. It is not convoluted or cluttered with unnecessary features or options. Asana makes it easy to create, assign, and collaborate with team members. Sections: In Asana, sections are used to categorize and group individual tasks within a project. Different companies use the sections feature for different purposes, including bug tracking, recruiting/applicant tracking, and status reports for manufacturing (with section titles like “paid,” “shipped,” and so forth). Applying sections to your projects is a good way to customize Asana for your business’ specific needs or requirements. Some of Asana’s competitors do something similar with “milestones,” but I think these “sections” feel more versatile. Tasks: This is essentially a high-level task management software, so it’s not surprising that tasks receive a lot of attention. Tasks, in this software, are defined as things you own, want to get done, or need to remember. Asana is somewhat unique in that it allows for tasks to be assigned to anybody by anybody. According to the product’s website, “We recommend encouraging everyone on your team to create tasks and assign tasks to everyone else (even to direct reports to managers). Asana is most useful when anyone can contribute their ideas and move action items forward.” Tasks can be created from scratch within your account or derived from emails (which may be forwarded to a special address within Asana). 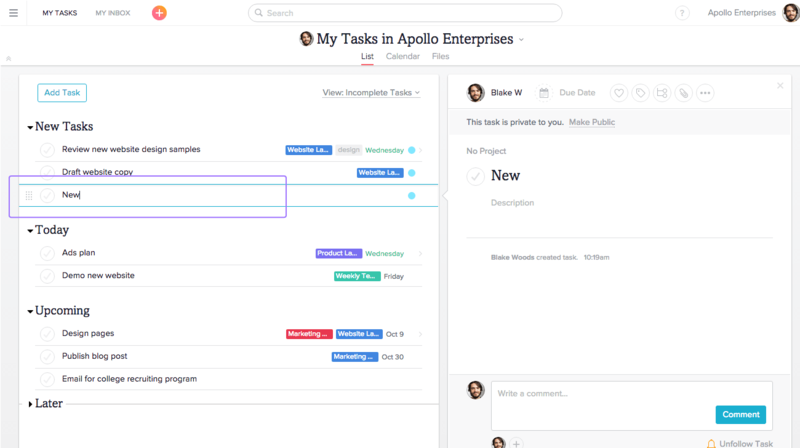 Asana’s simple UI allows users to organize tasks into three groups: Today (stuff you’re working on right now), Upcoming (work that will be coming in the next couple of days or weeks), and Later (tasks that are currently on the shelf). You may prioritize your task categories as you see fit. To further aid transparency in the workplace, Asana recommends that users make their tasks public. That way, employees and managers alike can check in on their coworkers without having to physically interrupt the working process. Timeline: Increasing Asana’s versatility is the new (in 2018) Timeline view. Some might consider the addition of a Gantt chart view to a project management tool years into the development of the product as an indication that somebody missed the trick earlier, but frankly, I disagree. Asana’s Gantt view is beautiful and well worth the wait, especially with the intuitive ways you can create dependencies between tasks. Workspaces: Workspaces are analogous to organizations, but are tied to individuals instead of companies. Basically, if you use a personal email address, you end up with a workspace, and if you use a company address, you join an organization. The two function in basically the same way, but since you join Asana as an individual, not just as part of a company, you have access to both. Templates: Asana lets you create new templates straight from the drawing board or derive them from any existent task or project. Templates are great for building tools like interview questionnaires, new client checklists, and so forth. Dashboards: Dashboards and Project Overviews are relatively new to Asana and make it possible to both track the completion of tasks in individual projects over time and receive helpful status updates from project owners. Periodic updates are displayed prominently on the project Dashboard and allow admins to keep a careful eye on each project’s overall progress (or lack thereof). If you don’t need or want to check that kind of information every day, you can get Dashboard digest emails which are sent every Monday morning and include the most recent status reports and progress charts on every project you’re following. These aren’t the most robust reporting tools around, but they are a nice addition to Asana’s basic task management features. Calendar: The calendar feature, color-coded for increased visibility and practicality, is new to Asana, but it is actually quite a useful scheduling tool, especially because there are no other scheduling functions available (like Gantt charts, etc.). Conversations: Conversations are the primary method for communication in Asana. There is a “conversation” unique to every project, and also one for every team within your organization. Once in the “conversation” section of your team or project, you can post new topics, which other team members can respond to. It is a little like a forum, where you can post relevant information to get your team talking. Recently, Asana added the ability to turn conversation messages into tasks directly, which is a handy addition. Progress Tracker: One of the big complaints about Asana since our very first review was that it was difficult to track progress at a single glance. That complaint is addressed with Asana’s progress tracker that is part of their custom fields feature. Using custom fields and the related API, you can create workflows to keep tabs on the progress you and your team have made on your projects. Board View: Board view has been taking the project management world by storm in the last year, and Asana is one of many software providers to add it into their product. Pioneered by the likes of Trello, board view mimics the classic project management technique of using sticky notes and whiteboards to track progress. This is one of my favorite methods of project management, so I am happy to see it included here. Additionally, Asana offers an open API. Regular Back-Ups: Asana frequently backs up customer data and has safeguards not only to prevent potential data loss but to aid in data recovery. Secure Hosting: Data is hosted in secure SAS 70 audited data centers. Relational Database Services (RDS): Asana employs Amazon’s RDS to manage all of their user data. This allows Asana to perform point-in-time recovery of the entire database at any moment in time over the previous 8 days. Asana, in my opinion, is an exemplary task management tool. Sleek, simple, and elegant, this software functions with ease and efficiency. I appreciate the fact that it is offered free for groups of up to 15 people and made financially accessible for students, non-profits, and start-ups. Every company has to start somewhere, and Asana is the ideal choice for small businesses struggling to get on their feet. The problem with Asana, of course, is that it is a task management tool. For many businesses, this software will not come with enough bells and whistles to make it worth the monthly fee. When it comes to providing a comprehensive solution for project management—planning, budgeting, tracking risks and issues, managing resources, etc.—Asana just doesn’t keep up with the competition. Granted, I don’t think the creators of this software are trying to revolutionize the project management market; I think they have spent a lot of time and energy developing an extremely good tool for managing small units of work and have purposefully ignored all the other stuff. Asana is what it is—one of the best tools (maybe even the best) of its kind – and it doesn’t pretend to be anything else. Enterprise-level businesses should probably steer clear of this software, at least for now, but I do heartily encourage small and medium-sized operations to give Asana a try. What it lacks in features it makes up in sheer usability and a wealth of relevant integrations. We love it – this program has without doubt reduced the number of meetings etc. within our organisation and saved a lot of time in terms of teams sharing the same view and being better connected with the project.